The cognitive development and behaviour in the first six years of life of small for gestational age (SGA) babies born at term are reviewed. Differences in sample selection and confounding factors associated with socioeconomic background, perinatal complications and biased follow-up make the interpretation of results and the comparison of studies difficult. Studies of infants (< 12 months) generally do not show any differences between SGA babies and controls. One study, carried out in Brazil and including comprehensive data on socio-economic background, parental literacy and infant stimulation, showed that low birth weight (LBW) babies were more vulnerable to effects of the environment than normal birth weight (NBW) babies, thus illustrating the importance of looking for interactions between covariates, rather than controlling for them. Deficits begin to appear in the second year of life, but are mainly found in high-risk subgroups. In all three studies of SGA children tested at 3 years of age, the SGA children had lower scores than NBW controls. SGA children tested between 4 and 7 years had generally lower scores than NBW, but differences were smaller and sometimes did no longer reach statistically significant levels. Some recommendations are made for future studies. It is estimated that 16% of births globally are low birth weight (LBW < 2,500 g) and more than 90% of these are in low-income countries. A greater proportion of LBW infants in low-income countries is reported to be small for gestational age than in developed countries (Villar and Belizan, 1982). Although the reported duration of gestational age is often inaccurate (Goldenberg et al, 1989), it is clear that LBW, small for gestational age (SGA) babies are a major problem in low-income countries. The subsequent development of these children is obviously of critical importance both to the future of the children and the individual nations. There is a burgeoning literature on the development of LBW infants, albeit mainly from developed countries. Aylward et al (1989) conducted a meta-analysis of 80 studies which showed that LBW infants tend to have poorer development than normal birthweight infants (NBW). However they point out many weaknesses with the studies. There are fewer studies of SGA infants and they have even more problems. IUGR includes infants whose growth is slowed below a certain level for a period of time in utero but reach average birth weights. A few investigators who have studied the children's development have had one ultrasound measure of foetal size (e.g. Nelson et al, 1996). However extremely few have actually assessed growth in utero with repeated ultrasound measurements (e.g. Harvey et al, 1982). At least in developing countries, it is generally not possible to determine whether and when intrauterine growth was retarded; most studies have therefore focussed on babies who are SGA at birth. The WHO recommend using the 10th centile for gestational age as the cut-off to define IUGR (de Onis and Habicht, 1996), however, it is far from clear whether this high cut-off identifies a population at risk of future poor mental development. SGA babies have a greater incidence of perinatal complications than NBW babies (Kramer et al, 1990; Scott and Usher, 1966) which may detrimentally affect their subsequent development (Low et al, 1985). However, children with perinatal complications have been inconsistently omitted or included in studies. It is helpful to separate the different risk factors. But, where treatment of these conditions is inadequate or not available, it may be argued from a public health perspective, that their effects are an integral part of the risk attached to SGA. Similarly, some investigators have excluded children in special schools or with major neurological handicaps whereas others have not. Samples of SGA children can be difficult to collect in developed countries and in some studies the sample size has been small on enrolment (Hawdon et al, 1990; Walther and Ramaekers, 1982; Parmelee and Schulte, 1970). In addition, the dropout has frequently been large (Pryor, 1992; Westwood et al, 1983). More importantly the dropout is highly likely to be biased (Wariyar and Richards, 1989). An example of this comes from a Brazilian study we have just completed (Grantham-McGregor et al, submitted) in which the children who were lost to follow-up at 12 months of age had significantly lower developmental levels at 6 months than the ones located. In studies where either the sample is small or the dropout biased a finding of no deficit in SGA children must be interpreted with caution. Children's development is affected by a wide range of factors both in the macro- and microenvironment, such as the quality of mother-child interaction (Bradley and Caldwell, 1984), maternal occupation, education and IQ, the quality of housing and crowding (Gottfried and Gottfried, 1984). Some environments are facilitatory and some non facilitatory (Horowitz, 1989). Furthermore these factors may interact with each other and with the child's biological condition in their effect on the child's development. This was shown by Drillien in her classic studies of LBW babies. She found that not only did birth weight interact with social background on the children's later cognitive function but neurological abnormalities in the neonatal period were associated with later poorer development in LBW children but not in normal birth weight children (e.g. Drillien et al, 1980). SGA babies tend to come from poorer homes than normal birth weight babies. This is especially so in low-income countries where the aetiology of SGA is more likely to be due to factors associated with poverty (prepregnancy maternal nutritional status, maternal weight gain, and infections) than to biomedically related causes such as multiple pregnancy, genetic influence and placental anomalies (Villar and Belizan, 1982). Although most studies have had some measure of social background, they may be limited to one or two variables such as paternal occupation. Relatively few studies have had comprehensive measures and examined possible interactions between them and birthweight. In the rest of this paper I will review studies of the cognitive development and behaviour of children who were born small for gestational age (SGA) at term. I have restricted the review to term babies because these children represent the vast majority of LBW babies globally and are a major public health concern in developing countries. I will only mention studies that include preterm babies if the latter were an extremely small proportion of the sample. I will restrict the review to children up to 7 years of age and cognition and behavioural outcomes because Hack will review studies of older children and Goldenberg et al. have covered neurological findings. The studies will be divided into those including children under two years and older. We found six studies of term, small for gestational age (SGA) or LBW infants whose development was assessed in the first two years of life. The details of these are given in Table 1. All but one (Villar et al, 1984) were in developed countries. The Bayley Scales had been used in three studies (Nelson et al, 1996; Low et al, 1978; Rubin et al, 1973), and the Denver Developmental Screening Test (Tenovuo et al, 1988), the Gesell Scales (Parmelee and Schulte, 1970) and a composite of infant tests (Villar et al, 1984) in the others. All of the studies in which children less than 12 months were examined (Parmelee and Schulte, 1970; Villar et al, 1984; Low et al, 1978; Rubin et al, 1973) failed to find differences between SGA and NBW infants. In two of them (Villar et al, 1984; Low et al, 1978) differences were found in the second year. All of the four studies that examined children between 12 and 24 months found deficits in the SGA groups (Nelson et al, 1996; Villar et al, 1984; Low et al, 1978; Tenovuo et al, 1988) but these differences were attributed to particular subgroups. In one study in the USA, it was only the male or black SGA children who showed a deficit (Nelson et al, 1996), in another (Tenovuo et al, 1988) the authors pointed out that the deficits were almost entirely due to children who had neonatal asphyxia or congenital anomalies. However they used the Denver Screening Test which is unlikely to be sensitive to small differences in the normal range. 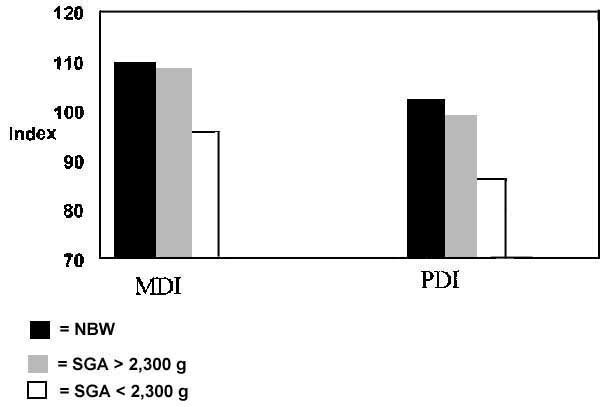 In another study (Low et al, 1978), the deficit was shown to be entirely due to children with birth weights below 2,300 g (Figure 1), and in the remaining study (Villar et al, 1984) the difference was only significant in those who had appropriate ponderal indices (API) at birth. However this latter group is usually the largest group of SGA children in developing countries. In another study, not in the above list because it is not possible to separate term from preterm infants, Low and colleagues (1985) focused on foetal and newborn complications. They found that growth retardation was not associated with development at 6 and 12 months as measured on the Bayley Scales except through associated complications, particularly encephalopathy. We have recently finished a study of the development of LBW term infants (LBW-T) in Brazil (Grantham-McGregor et al, submitted). The children were only followed for 12 months, however the results illustrate the importance of looking for interactions between covariates rather than controlling for them. Two cohorts of children all born in Pernambuco, northeast Brazil, a LBW-T group and a normal birth weight group (NBW) were compared. No infant who suffered from any illness in the first week was enrolled. The children had their development assessed at 6 and 12 months with the Bayley Scales. At 12 months their behaviour was also assessed on rating scales. Comprehensive data were collected on their socio-economic backgrounds and parental literacy. In addition the stimulation in their homes was assessed. The LBW-T infants had significantly lower MDI and PDI scores than the NBW group at 6 months and the difference was larger at 12 months. Both groups' development was related to their standard of housing, family income, wealth rating and paternal education level. The development of the LBW-T infants was affected by the quality of home stimulation at 6 and 12 months of age whereas the development of NBW infants was not. Similarly, maternal literacy had a marked benefit on LBW-T infants' development but not on NBW infants' development. The LBW-T infants were clearly more vulnerable to the effects of the environment than NBW children. Children from some of the studies in Table 1 were followed through to this age range (Villar et al, 1984; Rubin et al, 1973; Goldenberg et al, in press). Rubin and colleagues (1973) assessed the children at 4, 5 and 7 years of age. However in the analyses, they pooled the term children with two groups of preterm ones (SGA and AGA). They reported that IQ, language development and reading readiness were worse in LBW children controlling for gestational age. The SGA term children were more likely to be retained in a grade level or be in a special class at 7 years. The remaining studies are shown in Table 2. 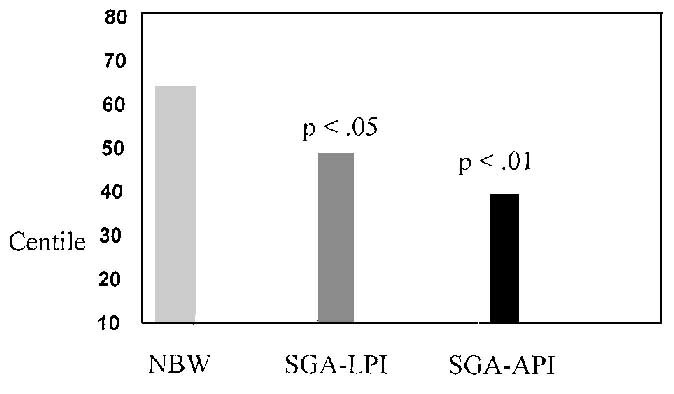 In the Guatemalan study (Villar et al, 1984) the children were assessed at three years and both API (appropriate ponderal index) and LPI (low ponderal index), SGA children had significantly lower scores than the NBW group (Figure 2). Also in 7 of 8 subscales the API group scored lower than the LPI group. These data came from a large longitudinal study, and Gorman and Pollitt (1992) also analysed data from the same study. They used data from children's assessments at 3, 4 and 5 years of age. A battery of tests was used and their scores formed two factors; memory and verbal. They only looked at API SGA children and found that at three years of age they had significantly lower scores on the verbal factor than NBW children. There were significant interactions between SGA and socio-economic background, and SGA and growth in the first year of life. SGA children scored lower than NBW children if they came from poorer homes or grew more slowly in the first year. Goldenberg and colleagues followed up children from the American study (Nelson et al, 1996) at 5 years of age, they report the IQ's of the black children only (Goldenberg et al, in press). The SGA children had significantly lower scores on the WPPSI than NBW children. The difference tended to be greater in API children (6 points) than LPI children (2.4 points) but this was not significant. Details of the six remaining studies, which we identified, of children between two and seven years are given in Table 3. All are from developed countries. In two, children were assessed on more than one occasion (one study, Harvey et al, 1982; Fancourt et al, 1976; second study Fitzhardinge and Steven, 1972). Combining Tables 2 and 3, there are a total of ten reports from 8 different study samples. Significant differences were found favouring the NBW group in 2 of 2 study populations at three years of age (Gorman and Pollitt, 1992; Walther and Ramaekers, 1982; Villar et al, 1984). There were six studies of 4 to 5 year olds and differences again favoured the NBW group in all of them, but they were not sufficiently large to be significant in two (Gorman and Pollitt, 1992; Babson and Kangas, 1969). In a third study, the SGA children had had repeated ultrasound measures in pregnancy (Fancourt et al, 1976) and only the subsample to have suffered from IUGR in the first 26 weeks of intrauterine life showed cognitive differences. Similarly this was the only group to show differences when they were reassessed at five years (Harvey et al, 1982) (Figure 3). Significant differences were found between the whole groups of SGA and NBW children's IQs in two studies (Pryor, 1992; Goldenberg et al, in press). Both API* & LPI* lower than NBW, API lower than LPI in 7 of 8 tests. Verbal factor score*. Memory factor score*. Figure 2. Composite cognitive scores of 3 groups of children at 3 years of age in Guatemala (Villar et al, 1984). LPI = low ponderal index, API = appropriate ponderal index. Two further reports of children aged approximately 6 years, included measures of cognition (Gorman and Pollitt, 1992; Fitzhardinge and Steven, 1972) and the SGA children had lower scores but they failed to reach significant levels. In one of them, SGA children had increased school failure (Fitzhardinge and Steven, 1972). In one study of six-year-olds, cognition was not measured but school behaviour and achievement were (Hadders-Algra et al, 1988). Little difference was found in the SGA children's behaviour, but they had more school failures and neurological problems.